Last year at Prime, Hothead Games had two different games they were showcasing, the sequel to Deathspank, which was playable, and Swarm, which was not. I was happy to get another chapter of Deathspank and a souvenir pair of thong underwear, but left without too much knowledge about their Pikmin-like game which featured a mass of tiny blue critters who appeared to ‘swarm’ together in order to survive. Well, the wait is over because Swarm, an action-platformer that is as sadistically cute as a toxic waste covered button, is out next week. I was able to play through the first level during the convention, which was fun and horrible at the same time. You start with 30 tiny, fat bellied blue critters and instantly kill most of them by progressing over the treacherous terrain. When I squeaked out a sound of protest the Hothead employee consoled me by telling me that it was intentional. “You have to get used to the idea that part of the objective involves a lot of sacrificing”. I was mollified, but still tried to save as many as possible with a pouty expression on my face. Poor little dudes. The introduction level takes you through the basic mechanics of how to control the swarm, from dashing forward to leaping across pike covered valleys while hurrying along a crumbling platform. Although you can’t prevent them from splatting into blue goo all over the place, spawn points appear periodically and replenish your count, so the ultimate goal is to keep the group from reducing in numbers below zero. At one point Matt was running through a landscape full of mines and managed to keep just one terrified swarmee alive until he reached the spawn point. It appears that a large portion of Swarm’s fun factor will be in these moments of held breath, cheering on the survivors in an environment hell bent on eliminating everything in sight. In that one instance I wanted nothing more in the world than for that lone critter to prevail. For those who favor the cruel side, finding the most creative way to ‘off’ your swarmites could be equally entertaining, but doesn’t seem terribly challenging since they are itching to jump off cliffs or dive into toxic goo at your command. I am a fan of these dark humor, full color arcade experiences. I can almost hear the laughter of the development team as they introduce new elements to the design. There is definitely a time and place for long and emotionally charged narratives, but the light and intentionally tongue-in-cheek games remind me of the more simplistic, 2-D titles I played when I was growing up that required you to merely push buttons on the controller in a satisfying way while enjoying the scenery along the path. No intense storyline to follow, no complicated choice patterns, just me and my console spending a few hours entertaining one another. And now that I know how it works, my personal challenge will be to do whatever it takes to keep my troop of critters alive, no matter if Hothead thinks I should just accept their imminent demise. 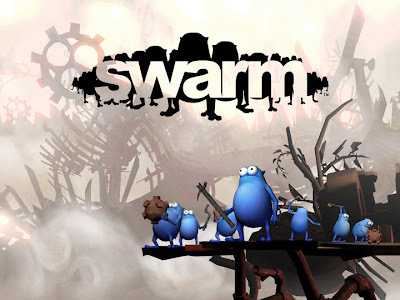 Swarm will be available on PSN on March 22 and XBLA on March 23.